The Titanfall Arcade is now open and I can only hope that the people who made it were kept far, far away from Titanfall itself. I don't know how "8-bit is better with a Titan," exactly, but I can tell you one thing that isn't: the old Atari classic Asteroids. It's not an inherently bad idea and given how simple it is - Asteroids, but with a vector graphics Titan instead of a triangular spaceship - you might think it would be pretty hard to screw up. You'd be wrong. It looked solid enough when I first started playing and the Titan's super-powered weaponry made short work of the many asteroids swarming around. 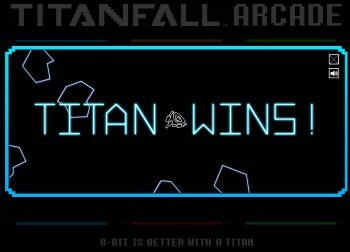 But it seemed a little too easy, even for an arcade oldster like me, so when the "Titan Wins" message popped up after 30 seconds or so of play, I gave it another spin with a little less focus. And I won again. And again. And again. I eventually came to realize that the Titan is invulnerable, and that I could start the game, ignore it for the requisite amount of time and still "win," albeit with a less-than-spectacular score - you don't get points for destroying asteroids by letting them smash into you. It is, in other words, an effectively worthless implementation of the game; after all, if you can't lose, why play? It may seem like a disproportionate amount of complaining about a free Flash promo-game, but Titanfall is going to be a big, big release for EA, and given that it's following the SimCity and Battlefield 4 multiplayer train wrecks, it needs to be airtight from top to bottom. Yet this is how EA sees fit to promote it? Respawn puts together a game that just might have what it takes to unseat Call of Duty as king of the online shooters, and EA can't even hire someone who knows Flash programming well enough to whip up the equivalent of a high school project? The mind boggles. Missile Command and Centipede are "coming soon" and will hopefully be better - I was a big Centipede fan back in the day - but given their relative increase in gameplay complexity I'll be happy enough if they don't crash my browser when I launch them. I certainly hope that Titanfall arrives in better shape than this.